Border nightmares and fairytale hospitality! Italian Long Riders Dario Masarotti and Antonietta Spizzo spend as much time as possible in the saddle. Here Antonietta explains the horrors of crossing borders on horseback, and the joys of travelling through Europe and meeting the locals. 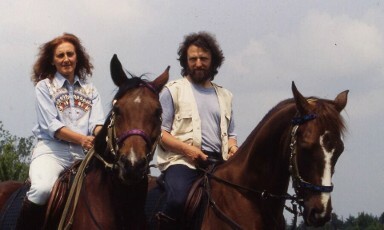 Since 1993 we have ridden our horses every summer across Europe or Italy. We always start from home (Premariacco, a small town in Northern Italy) and we don't have any car support. We have already been in Germany and in France, in Slovenia, Hungary and Romania, in Ukraine and Belarus, in the Czech Republic and Poland. In this article I will discuss exhaustively the problems we had with border crossings. Now the EU has 10 new members and everything will be much easier for us riders on horseback... maybe it's a little bit to late to tell my story... anyway I hope my adventures will be helpful for anybody who wishes to prepare accurately a new journey. Making a journey on horseback is very different from just driving a van with a horse on it! First of all, you usually need more than 10 days to do that, and 10 days is the normal expiry date of all vet documents. And since nobody does it, nobody knows exactly which papers are necessary, not even the customs at the border crossing-point nor the veterinaries. Every office says something different, and at the end the vets sit quietly in their rooms but it's we that have the problems at the borders! Last but not least, we must remember that a horse is not considered by the law a means of transportation but only potential food (oh, my God!) and at the same time “normal goods“ by the customs. 1. Veterinary certificates: in the language of the issuing country and in the one of the country of destination. Check very carefully in advance which are the blood tests needed for each country and remember that if you have a stallion everything becomes 10 times more difficult! 2. Customs papers: the so-called ATA Carnet is like an insurance that you make at the local Chamber of Commerce in order to make sure that you won't sell your horses without paying the customs. Check if the country you're traveling to recognizes this kind of document (Former Soviet countries don't). 3. Transit permits, to be issued, if required, at the Ministry of Agriculture of each country. (This is a really complicated matter if you don't know the right person in the right place). Usually you have to declare your route, the time needed for the journey and sometimes also list all the places you'll be staying at. The region we live in, Friuli in Northern Italy, is a real border territory: from its main town, Udine, it is only 40 km to the Slovenian border in the East and about 90 to the Austrian border to the North. Our home town Premariacco is very close to the Slovenian border, only 12 km. It's only natural that our biggest wish was to visit these beautiful countries on horseback! Austria became a member of the EU in 1995. Before, it was very complicated to go there on horseback, especially because nobody knew exactly which papers were really necessary. Until 1995 only one person we knew dared to ride to Austria from Friuli, I will call him Mr. X. Mr. X crossed the border only on small paths on the mountains, far away from the policemen's eyes, and he knew very well the owner of an Austrian riding club near the border. This man would help him in case of need or unfortunate meeting with Austrian police, saying he was the owner of the horses of Mr. X. And what about Slovenia, so close, so far? A beautiful country, full of unspoiled landscapes, small villages reached only by unpaved roads or paths, with very hospitable people, a veritable paradise for horse-riders! A real dream, but unreachable like all dreams. So many people here pretended to have crossed the border at least once on horseback, but we knew it was not true. The ex terrific border of the Iron Curtain was (and still is) almost impossible to cross on horseback. On a sunny afternoon in 1998, after a good lunch in a famous restaurant near to the border – the wine they had drunk made them probably think they were invisible - a group of 25 (!!!) riders decided to try their luck and crossed the border illegally, led a guy who pretended to know the place as his own pockets. But after 10 minutes they were caught by the Slovenian border police and only with a trick they escaped a big fine or maybe to be arrested... I feel so ashamed for them that I won't tell one more word about this stupid story and leave it to the judgment of my readers! Coming back to our personal experience, after we had measured ourselves with two shorter journeys in 1993 and 1994, we went on horseback through Austria and Germany in summer 1995 and after 50 days we reached the North Sea in Gdansk. After the complete success of this journey we found the courage to take out a project of 3000 km from our box of dreams: a journey on horseback across Slovenia, Hungary, Ukraine, White Russia and Russia, reaching Moscow!. The preparation of this journey took us about two years. A very long time was necessary in order to learn Russian, but this language is so beautiful that it was never a boring activity. Anyway it proved absolutely necessary for solving problems in everyday life, and we should have been studying a little bit of Hungarian as well. On the other hand, very boring and often frustrating were all the endless bureaucratic formalities for our visa, the veterinary certificates and the customs documents. On this occasion nobody, not even consulates and international forwarders, knew exactly what was necessary to be done and we also understood how deep-rooted was (still is???) the prejudices against the Eastern countries. In short: nobody would take us seriously. Why did we want to travel on horseback across these (seemingly) dangerous, unfriendly countries ? And although our journey was of European importance, we did not find any sponsor. It took us months and months of work in order to get all papers ready, but at the end so many things went wrong that we understood the importance of the smallest details. Never underestimate details when traveling with horses! All the problems we had during this journey came from bureaucracy. Our book “C'era una volta l'Est – Once upon a time in the East” tells many details but doesn't penetrate deep into the matter, but now I have the chance to tell exactly everything that happened. The most difficult border proved to be the Slovenian one. We had applied for the transit permit in March but two days before our departure it was not yet ready and we needed the help of the Italian Consulate in Ljubljana (by chance we got to know somebody who knew somebody who worked there). We still don't know why it was so difficult. We were asked first about the exact route, after one month about the exact addresses, the last time about exact time of staying in each place. We guess the Slovenian employee didn't know what to do with us and hoped to win the battle by exhausting the enemy. For Hungary and Ukraine we were so lucky to know a young and efficient forwarder, Mr. Marco Moroldo in Budapest. He succeeded quite quickly in getting the right papers for us. We were told that for Belarus and Russia no transit permit was necessary. And what about our visa? We had official invitations from the Equestrian Federations of Ukraine, Belarus and Russia. But this was not enough, there were (and still are) continuous changes in the procedure to get a visa for the former Soviet Republics. The lack of the original stamp of the Ministry of Foreign affairs of Moscow deprived us of the last part of our journey: 400 km from the Belarussian border to Moscow, that should have been the jewel in the crown ! Until September 19th we tried to get the necessary papers so we could keeping on riding eastwards, but then we had to give up: on October 1st we had to be back in Italy. So we rode along an alternative route , because we want to keep our program to ride 3000 km, be it to Moscow or not. We ride back across North Belarus and on September 24th we arrive in Minsk, the capital. ...but coming home is even more complicated! According to the agreements made by phone, our friend and neighbour, Albano Muradore, should have been in Minsk on Sept. 25th with his car & trailer and we should all drive back home together. But he was delayed for 5 days because the Ukrainian visa wasn't ready, so he reached us only on Sept 30th. But all our docu­ments expired on this same day – waiting for him we just try not to think of the imminent catastrophe. When we arrive at the Ukrainian border we try to get an extension of our visa, but it's impossible. Only the horses are allowed to pass with Albano, whose visa is in order. We drive back and try our luck at the Belarussian-Polish border: nothing to be done, they don't recognize the vet documents and anyway we don't have a transit permit for Poland (see before the vital importance of this document). And we also have to pay a fine of 70 Deutschmarks because our entrance had been somehow irregular. The chief vet is a woman, she is very angry with the colleague who had let us in more than 40 days before and shouts with him on the phone, but this circumstance doesn't prevent her from finding a good place for the night for us and our horses. The next morning a decision is made: Albano will drive with the horses across Ukraine and we will go by train through Poland, we will meet again in Budapest. I will make it short even if it was not so simple: on Saturday we meet again and think to cross the Slovenian border on Sunday. There we are very early in the morning, but the Slovenian vet looks sadly at us and says: ”I'm sorry, boys, but on your transit permit (which is already expired, by the way) is not written that you would come back... only two small words are missing...”and back”... but I cannot let you in... today is Sunday and there is nobody at the Ministry in Ljubljana who can decide... now you have to go back to Hungary and wait until tomorrow... this is bad luck, my friends... but tomorrow we'll arrange everything within an hour” And so we did, we had to make all border formalities with Hungary again and wait there until the next morning. Only 250 km separated us from home, after more than 3 months!!! So we arrived home finally on Monday, October 6th., The homecoming lasted 7 whole days, but we learned something from these adventures: 1) always have the right documents; 2) always have them translated exactly and make sure they leave in every single word; 2) never cross a border on Sunday!!! 2001 we rode from Italy to Romania, and the first half of the journey was almost a replay of the one of 1997. But now we had a precedent and we knew what to do. Mr. Marco Moroldo from Budapest once again arranged all transit permits for us, Slovenian border vets know us already and everything is rather easy... anyway we need a lot of time and money to prepare all papers. When we come back after 2 months to Italy, on that day there are occasionally many Italian border vets at the border office. We have gone through almost all controls when one of them is caught by a sudden doubt and go to the PC and starts checking frenetically some mysterious matter on Internet. What's happening? They discuss very animatedly whether our certificates are OK, because we are not at a simple border point... this is the official EU border and we are coming – after a long journey - from so-called “third countries”. And some not very well-known EU law says that if a horse with an EU certificate stays more than 30 days in a “third country”, from the sanitary point of view he becomes automatically a “non-EU horse” and needs brand-new certificates. But we are lucky: we live, as I said, only 12 km from the border, and with a so-called “sanitary restriction” we are allowed to drive home with the horses. The official district vet comes with us and takes immediately a blood sample from our horses, who have to stay in quarantine at home. Everything ends well. In 2003 we rode across Austria, Czech and Poland to the Baltic Sea. Two months. Czech and Poland are not yet EU countries, so we need once again the ATA Carnet, the transit permit (only for Czech) and the veterinary certificates. For the third time we go mad before leaving because of all these different certificates (in Czech, Polish and English) and stamps. The vet of our district refused to sign the certificates because "he doesn't understand these languages" and sent everything to the Provincial Office that wasn't able to find the papers in time... so we had to delay our departure by two days. But this is nothing in comparison with the coming back! For the first time we didn't leave the EU at the beginning of the journey but after 20 days, in Austria, and the same will be returning. Knowing this potential difficulties, I had asked many times not only the competent district vet but also the chief vet and they agree: my papers are OK and their validity will be recognized by the Austrian police. I'm not so sure but at the Czech border the Czech vet tells me that they last 90 days and recommends me to keep it in my mind. *Nobody cares if you have papers for a gray horse and go over the border with a black one, you cannot persuade the vet to go outside and check the horses with his own eyes, no! But you must have the blue stamp and the red stamp in the right place, that's all. A Czech friend used to say: "That man is a very important vet because he has got the red stamp"
But let's forget now all these border nightmares, many of which will disappear with the new EU, and let's talk about the most exciting side of traveling on horseback (beside horses' company, of course!). I mean hospitality. We have ridden on horseback since 1993 in order to link our love for horse-riding to alternative traveling, without any car support and above all at a slow pace, to be able to explore the territory and establish true relationships with the people we had the chance to meet. Usually we spend the night with riding clubs, horse-breeders or farmers – places where we can find the right food for our horses. We never arrange this beforehand, only the first 3-4 days because we have now a lot of friends everywhere. After so many journeys in so many different countries, we feel sometimes like anthropologists in disguise - we can't help talking about some big difference in the hospitality in the different countries. This is of course only our personal point of view. Speaking the language, even if only a couple of sentences, is the most important thing! And I must recommend everybody to make this effort at home that will be repaid 10 times when you are “on the road“. In our experience, Austria and Germany revealed themselves not only as beautiful countries but also as a small paradise for riders and horses. People are in general very fond of horses and know what a horse needs. The persons which we had the chance to know always accepted us in a very friendly way and helped us a lot. Riders and horses find everywhere everything they need and prices are generally honest. Some hostels on the horse-trails are really good models to follow. Anyway: horses are deeply rooted in the collective imagination and this fact opens us the doors and the hearts. Slovenia is another paradise: people are very friendly, smiling, helpful to travelers, hospitable, they never are too oppressive but try to understand your needs. Slovenia appears to us an ideal country for a journey on horseback: the landscape is beautiful and vibrant, there are many good roads without asphalted surfaces and marvelous paths in the woods. On July 5th 1997 we finally crossed the border of the long desired and feared Ukraine. In our imagination we pictured this country on a map with the Latin sentence HIC SUNT LEONES ( Here are lions), which in ancient times meant the beginning of unexplored lands. But the only lions that can be seen in Ukraine are those on the coat-of-arms of the city of L’viv. It is a beautiful country: the sky is clear, the rivers are rich with water, green pastures with hundreds of hay sheaves reach to the horizon and people are open, generous and friendly. Since there are no Equestrian Clubs and/or inns for travelers, every evening we have to ask the peasants on the road for a place to stay for the night, and every evening we are invited to eat and sleep in a house, while our animals are tied in the yard or sometimes in a stable, if there is one large enough for two horses. Of course we always wanted to pay for the food and accommodation accorded to us and our horses, very well knowing the hard times Ukrainians were experiencing. But so many people didn't want to accept money in return, so sometimes we were very ashamed and felt guilty, and had to meditate a lot about their spontaneous generosity. Only after long insistence sometimes somebody accepted some money to buy a present for the children. In Belarus we got to know not only the hospitality of the peasants, but also we had the chance to have a look from inside at the economical structure of the kolchozes (agrarian cooperatives), where we are officially welcomed as “italianskaja delegazia” , the Italian delegation. The landscape of North Belarus is really beautiful. We felt as if we were in the middle of the book “Dr. Zhivago”: isolated groups of birches, dark fir woods, lonely lakes, whose shores were covered with yellow leaves. The wooden houses (cottages) with their brightly colored window frames stand out against the deep blue sky. The ground is soft, sandy, without stones; most roads are not asphalted or have a wide sandy edge on both sides. Here go the horse-driven carts, the most common means of transport in the countryside. Poland is in many ways very similar to Ukraine and Belarus. The Polish landscape is characterized by many scattered farms, small fields, animals on pasture, woods and meadows. People never try to disguise their surprise and curiosity when they meet us - no, they smile at us, greet us, and ask a lot of questions. It has of course a slightly unpleasant side when at every stop we find ourselves encircled by a dozen of curious and petulant kids, but it enlightens our heart in that moment of uncertainty at dusk, when we have to look for a roof for us and for our horses. We spent the night almost always with farmers. In the last days I could speak a little Polish, very little indeed, but it was very appreciated by our guests. In Poland hospitality is always very generous: the family who accepts us at night in their courtyard or in their home always prepares dinner (“kolazia”) for us and breakfast (“sniadanie”), and offers us the relaxation of a good shower (“prisniz”), a very pleasant moment after the long hours on the dusty roads under a terrible sun. The next morning, at departure, we are never allowed to pay for food, and sometimes we were able to sleep in a real bed (we had a tent). We never paid a zloty for the food of the horses, and not for ourselves either. The only sad thing is that, except in very few riding clubs in big towns, in the countryside there are by now no horses at all (and also few cows left). Many people told us, half joking half seriously, that the horses had been all sold in Italy and Spain to the horse-eaters. Of course we are not very proud to belong to a country whose inhabitants are famous as “horse-eaters” but most of all we are ashamed thinking about the inhumane conditions of transportation of the poor animals from Poland to South Europe. We use normal English saddles. Every horse carries 20 kg luggage besides saddle and harness. In the two home-made saddle-bags we carried clothes, toiletries, a pair of shoes, the topographic maps, a water bottle, some emergency (canned) food, a wide choice of medicines, a special tool for emergency horse-shoeing, 4 spare horse-shoes. On the back of the saddle we fix a home-made water-resistant cylindrical bag for the sleeping bag and the tent. In front of the saddle another bag for a woollen blanket and a raincoat for the horse. A good water-resistant map-holder, two nose bags for oats and a folding canvas bucket are absolute necessities. SEBIBA, bay mare, Arabian half-breed, born 1988 in our town and reliable, tireless companion of our first journeys. TEREK, chestnut Anglo-Arabian gelding, born 1992 in Sardinia. Since 1996 always in the front line with us!!! DIAMANTEA, our “new entry”, bay mare, Anglo-Arabian, born 1996 in our town.